What a great win by Jason Dufner at the PGA Championship. Notice how pure he was hitting his irons? Jason Dufner, along with almost every other top pro, hits the ball first and then the ground. Whereas any golfer that struggles with ball striking consistency, tends to hit the ground before the ball. Now there’s a theory about curving the ball one way to help with consistency. 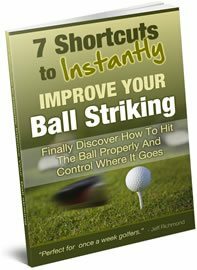 I want to propose another theory that will help you with ball striking consistency. And that theory is to train yourself to either hit the ball first then the ground, OR sweep the ball off the grass without taking a divot — erring on the side of a thin shot. When you look at a consistent golfer like Steve Stricker, you’ll notice that he takes very little divot with all his shots. And you very rarely see top pro’s hit the ball fat. But when you watch amateur golfers you will often see fat golf shots. So how can we train ourselves to sweep the ball, taking a small divot, if any? Well, the best way I’ve found to do it is not to hit off grass. You need to practice hitting off a hard surface. To do this, go to your local home improvement store and get a thin piece of wood (like plywood) to hit shots off. Or you can use something else similar, but it needs to be hard and smooth. It’s well known that many pro’s practice hitting shots from hard pan lies to work on ball contact. This is the same principal, but there will be very little give in the surface that you’re hitting off, which will help speed up your progress. While it’s true that you want a slightly descending blow when hitting your irons, it’s also true that you want to contact the ball first. And if you hit down too much on your shots, it will be very tough to get the timing perfect. 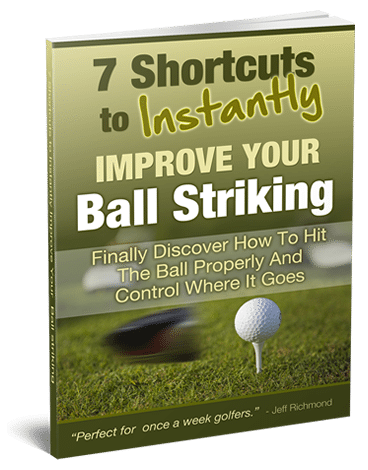 So by practicing off a smooth, hard surface you’ll be improving your ball striking consistency when you play golf for real, and you’ll hit longer shots. And speaking of longer shots, here’s my complete 21 day program to help you add 21 yards to your shots.